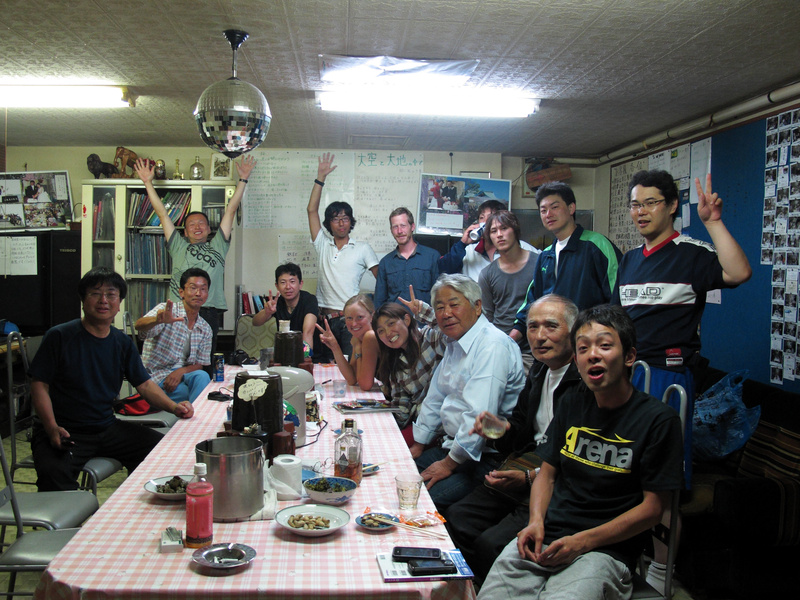 Hamatonbetsu to Wakkanai: We did it! Well, we finally made it! 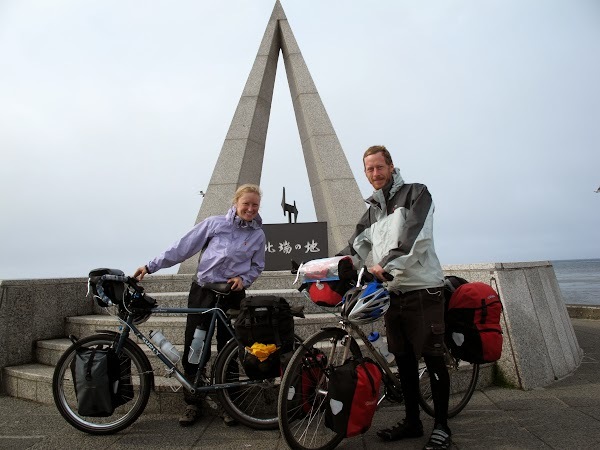 After almost 2,000 miles of riding, we reached the northernmost point of Japan at Cape Soya! The whole day was filled with so many of things that we have loved about traveling in Japan: beautiful scenery, nice roads, and lots of friendly people. 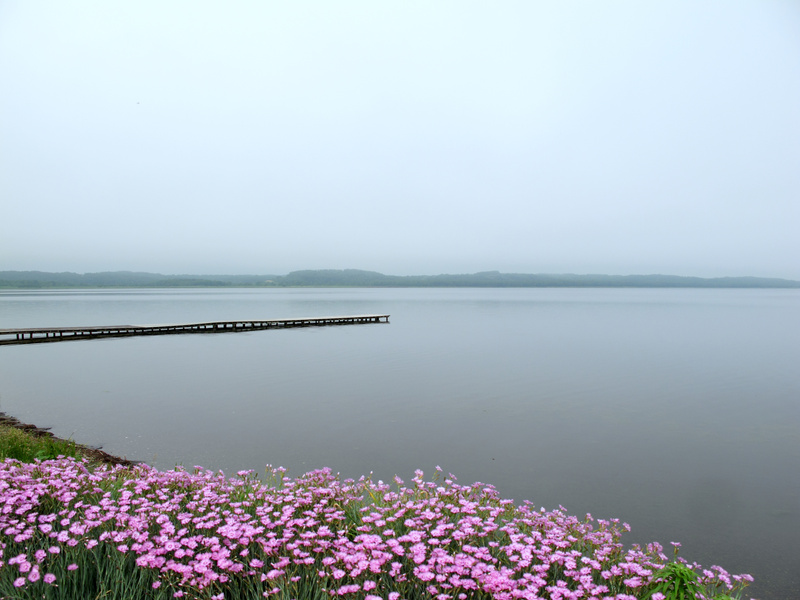 After reaching Cape Soya we rode down to Wakkanai (one of the larger cities in northern Hokkaido) and we’ll be staying here for a few days before heading down to Tokyo. Even though we had a longer ride today, we slept in a little and took our time packing up. The campground by the lake was very peaceful and had a great view, so we enjoyed a slow breakfast before finally heading out. There were a lot of other people staying there, and a few of them came over to talk as we got everything ready. When we finally got on our bikes, the campground owner came running out of the front office and handed us each a little souvenir so we would remember Hamatonbetsu! We hung them on our bikes and set out on the main road north. Just outside Hamatonbetsu we turned towards the coast on a tiny farm road that ran for ten miles or so through some great farmland right along the coast. We had the entire road to ourselves and enjoyed taking pictures of various sights along the way. After an hour or so, we rejoined the main north-south highway. This road–lined with massive metal shutters to protect drivers from wind and snow in the winter–took us through a few small towns through the morning, but for the most part we found ourselves riding in relative isolation along a rugged coastline. We had a couple of brief stops at road stations along the way, but took a little more time at the last Seicomart (convenience store) marked on our atlas before Cape Soya. We got some lunch, and also a small bottle of champagne and some snacks so that we could celebrate at the cape! With our stomachs full and our panniers stuffed with snacks, we were ready to finish the last 20 kilometers to our destination. As we approached Soya-misaki, the scenery grew more and more rugged, but was still incredibly striking: cliffs and low hills covered by short bamboo stands overlooking dark sand beaches; all of this stretching for miles in either direction without a single house or town in sight. There were a couple of steep climbs on the way but nothing too steep–even so, we felt tired on the way up since we knew we were getting close to the end of the trip (and our legs were telling us they were ready to stop!). We finally got to Cape Soya mid-afternoon, and found it to be much less isolated and peaceful than we had anticipated! Lots of people, tour buses, and souvenier stands, with constant music coming from one of the monuments littering the small park. We fought our way through the crowds to snap a couple of quick pictures and then ran away to hide in a quiet corner for our celebration. Fittingly, this was on a curb behind a bathroom: pretty much the same type of location we have been eating in for the last two months. Not too romantic, but it was out of the way and out of the wind! 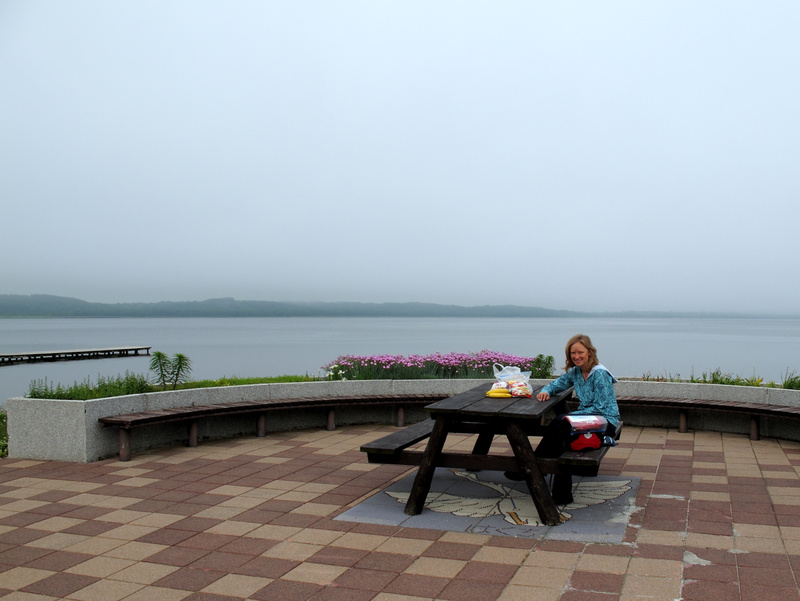 We had our champagne and snacks, bought a couple of small souveniers, and then headed out for Wakkanai–we still had 20 miles to go and no place to stay for the night. As we turned and headed south, the tailwind that had helped us all day turned into a terrible headwind, and we struggled for the first half. 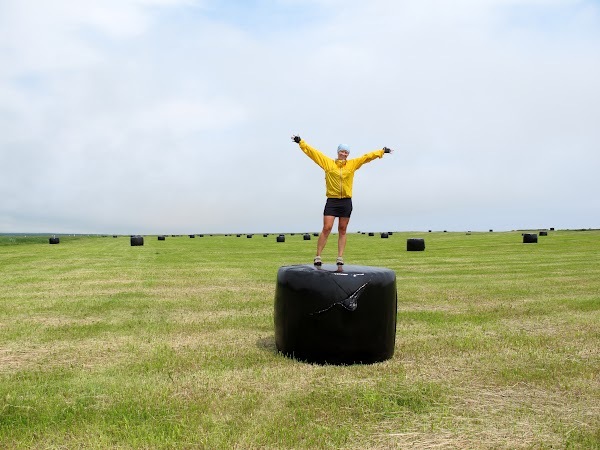 Gradually, we moved around the bay to Wakkanai, and the headwind turned to a tailwind–Vicky and I felt like we were back on our road bikes again! Along the way, we ran into a young Korean rider who was on a three-month trip from Fukuoka to Wakkanai and back. We took a couple of pictures with him and then headed on down the road. 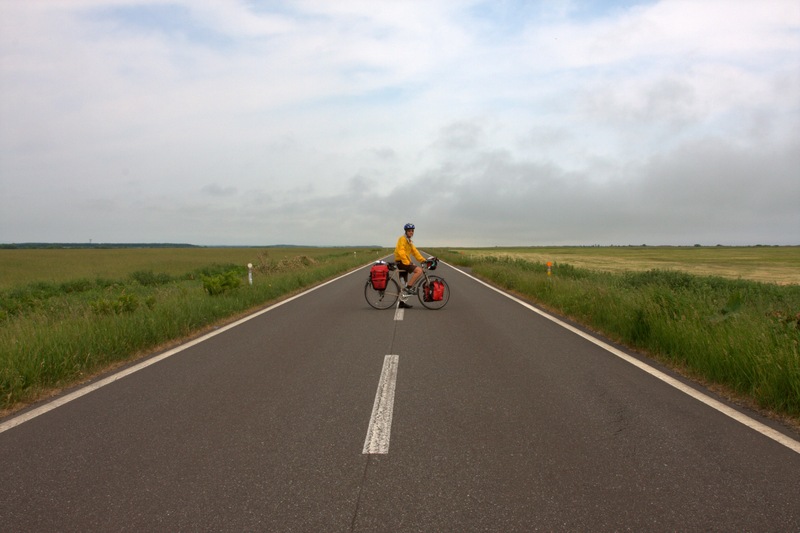 By the time we finally got into downtown Wakkanai we were tired and ready to stop riding for a while. Unfortunately, we had no luck finding a place to stay at first–all the hotels were either way too expensive or all booked up. We turned back south to try another area of town and as we were examining our map by the side of the road a couple of motorcycle tourists pulled up. One of them asked if we needed help and offered to take us to a rider house nearby to stay for the night. A “rider house” is a Hokkaido-only type of loding that is typically used by motorcyclists who need a cheap, easy place to stay for the night while touring around the north. Fortunately, these places are open to cycle tourists as well! We followed these two guys down a couple of streets, and found ourselves in front of a public bath house, a garage filled with motorcycles, and a sign advertising the “Midori No Yu Rider House”. Within a few minutes, we were checked in–for $10 each we got a bed to sleep in, full use of the kitchenette and bathroom, and a bath next door if we were so inclined. 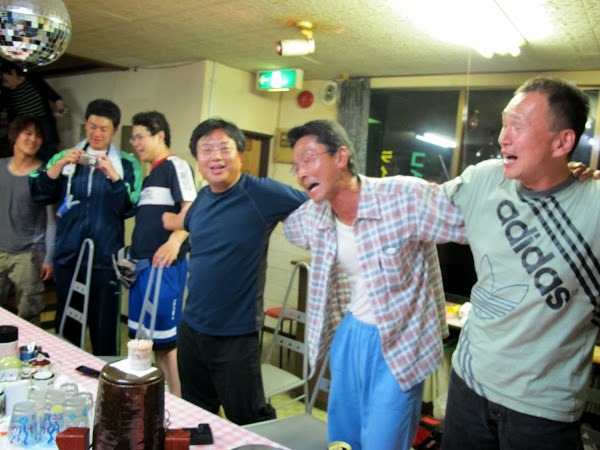 The rider house was run by a tiny chain-smoking mama-san in her 60’s who sat in the common room and watched TV as the house slowly filled up with bikers–by the time we got back from shopping for dinner the room was full of black leather, empty beer cans, and cigarette smoke. We sat down at the long table and joined in the conversation. 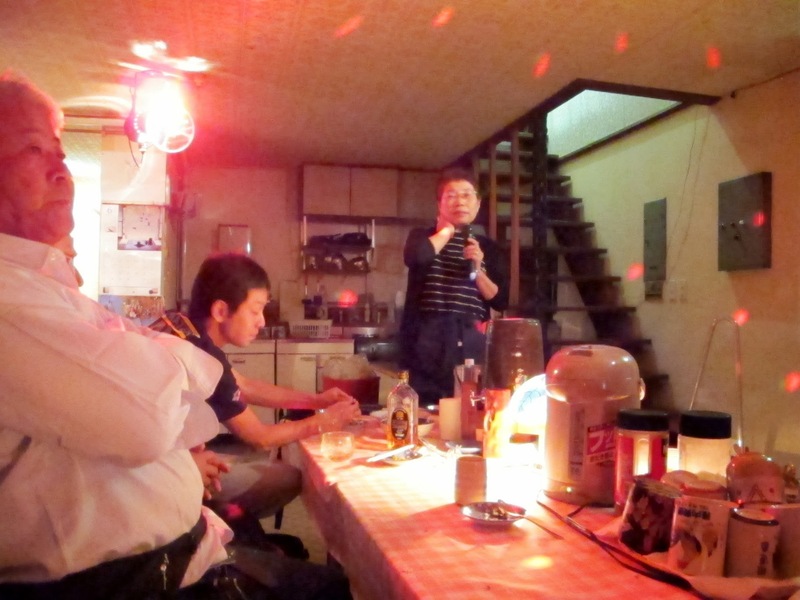 Around 9:00, the mama-san stood up and switched off all the lights except for two lava lamps and a small mirror ball. With karaoke mic in hand, she greeted everyone to the house and asked everyone to give their self-introductions. After we each took our turn, she had us all link arms and sway in time as we sang a famous enka song about Hokkaido–Vicky and I didn’t know any of the words, but we tried to help out where we could! Once the song was over, she uncovered two ceramic containers and a tray of glasses and informed us all that “beer and sake are all right until 9:00, but after that we need to drink shochu like real men!” The rest of the night passed in a blur of conversation, World Cup soccer (Japan vs. Paraguay), and at least a couple glasses of the potent liquor. By the time we finally pleaded fatigue and staggered off to bed, we had been treated to a great celebration of the end of our bike trip! Sounds like a solid end to an epic trip. Congrats guys! Sorry to hear about your laptop. Travel home safely, can’t wait to see you guys. How long did it take you guys to ride the length of Japan? What route did you take? I will be touring Japan next month and any information can help! Hi Julian! 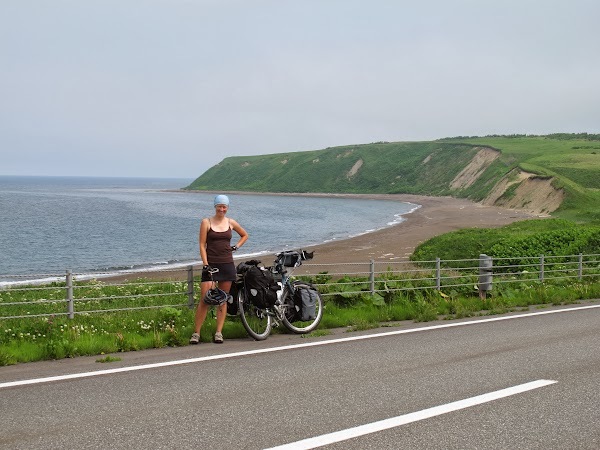 It’s great to hear that you’re planning your own bike tour in Japan. The whole trip took us about 9 weeks (plus another week of traveling and layovers in Tokyo/Wakkanai). If you look at the upper right of each post, you can see which day of the trip it was–for example, we reached Wakkanai on our 57th day on the road. Our whole route is shown on the “Route” tab, although the display may be a little confusing. The blue lines show our original intended route, and the flags show the route we ended up taking instead. Are you going to a specific area in Japan? One thing I would be careful about (especially since it sounds like you’ll be traveling in November) is that you can get into higher altitudes very quickly once you move away from the coast. This late in the year, it’s probably going to be very cold in the mountains–especially if you’re anywhere north of Kyoto / Osaka. Also, if you’re going to be camping along the way keep in mind that almost all campgrounds are closed after September. Good luck on your trip, and let us know how the trip turns out! You can always send us an email from our contact page if you need more info! I adore that site layout . How do you make it!? It is so good! Thanks! Vicky did the design, and I wrote some custom code for it. It took a little time, but less than you might think. Are you working on a site for a trip of your own? 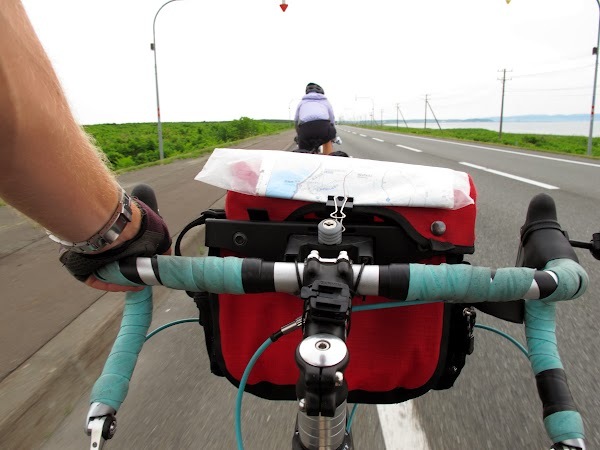 What did you do with your bikes once you got to Wakkanai? DId you pack them into boxes and fly out of Wakkanai or did you go back to Sapporo first. 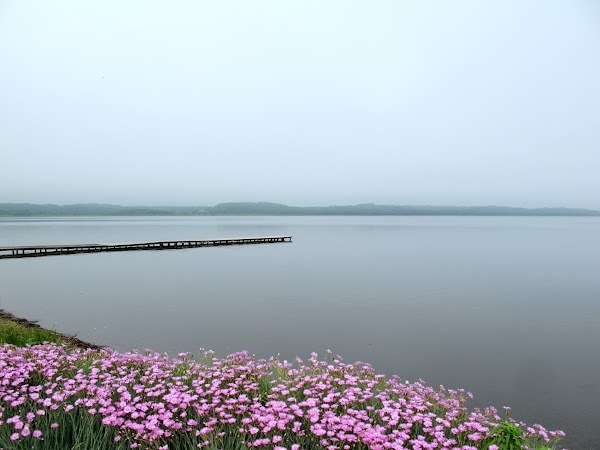 I’m trying to plan out a bike trip through Japan and was wondering what the options are once reaching the end of the route in Northern Hokkaido. 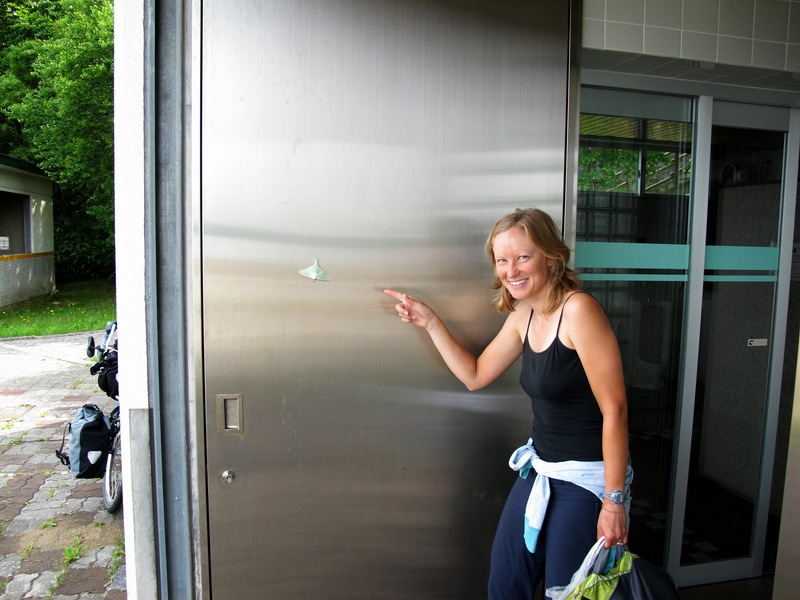 To be honest, it took a lot of work to figure out what to do with our bikes and equipment once we got to Wakkanai. Your options will really depend on the type of bike you have (larger touring bikes like ours are harder to pack) and what your plans are once you finish riding. * Spent a couple of days trying to find boxes to ship our bikes and equipment directly back to the U.S. This did not work out because it was very expensive AND we couldn’t find any boxes large enough for our touring bikes (the local bike stores get rid of boxes as soon as possible due to space constraints, and they are too small for Surly LHT’s anyway). * Realized we had to take our bikes back with us on the flight from Sapporo => Tokyo and then Tokyo => Los Angeles. * Bought two bike bags (typically used by Japanese to carry bikes on trains) from a local bike store (about $100 each) for packing our bags on the train & plane legs back to Los Angeles. * Took just our bikes and minimal gear for a side trip to Rishiri island for some hiking and sightseeing. * Came back to Wakkanai, disassembled / packed our bikes into the bags for the train ride from Wakkanai => Chitose. The hardest part was just dealing with getting to and from trains / airports with our equipment AND bikes in bags. If you’re planning on doing any sightseeing after the biking part of your tour is over, then definitely leave your bike somewhere (or ship it home) as soon as possible. It was really difficult to get through Chitose and Tokyo with our bikes packed away in heavy bags. Also, we were worried about not having the bikes in boxes, but it turned out this was better because the airport handlers recognized it as a bike rather than a meaningless cardboard box. We had some damage going to Japan (with our bikes in boxes), but none coming back. Good luck with the planning, and let us know how it goes!